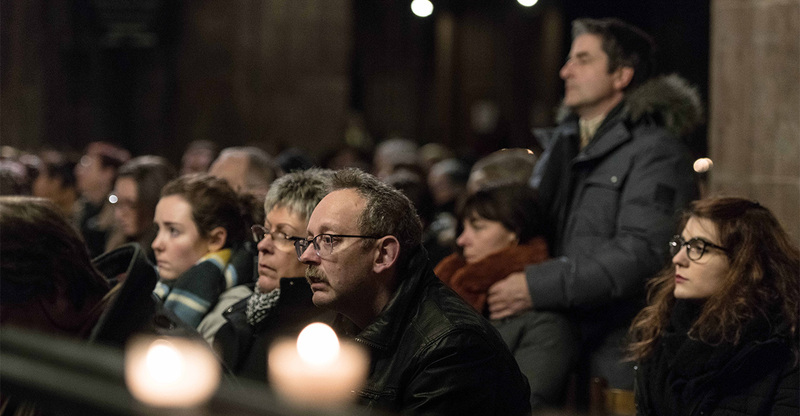 The deadly attack by a gunman at a Christmas market in France Tuesday was an unwelcome reminder of the threat Islamist terrorists pose in Europe and around the world. While police shot and killed the gunman Thursday night when he opened fire on them, the sad truth is that we can expect more attacks by terrorists like him for generations to come. In fact, French security forces say there are 12,000 young men, often with immigrant backgrounds, in the country who they call “gangster jihadists.” As The Guardian reported, some “start with petty crime, drug dealing and robbery, and graduate to terrorism.” Police say they can’t keep an eye on all of these people. French police identified the dead terrorist as Cherif Chekatt, 29. He was born in France and is the son of immigrants from Morocco. When Chekatt opened fire at the crowded Christmas market in the French city of Strasbourg he yelled, “Allahu Akbar”–Arabic for “God is greatest”–and then killed three people, left another brain-dead, and injured a dozen others, authorities said. Thankfully, the tempo of terrorist activity in Europe this year has dipped after the carnage that took place far too frequently from 2015 to 2017. The drop may have occurred because the ISIS terrorist group has lost territory in Syria. While there is still much to learn–from Chekatt’s whereabouts to any potential links he had to ISIS or other terrorist groups–what has emerged so far feels extraordinarily familiar. It was predictable that France was targeted first, because it is the European country that Islamists attack more than any other. While the most high-profile terrorist plots were those in Paris in 2015 and the Bastille Day attack in Nice a year later, 2018 has also seen five Islamist plots that led to deaths or injuries in France. The most potent attack so far this year was that carried out by Radouane Lakdim, the Moroccan who shot and killed four and injured 16 in southwest France. Authorities said Chekatt had a whopping 27 previous convictions for theft and other crimes across France, Germany, and Switzerland. While in prison in 2015, Chekatt apparently became receptive to Islamist ideology and was subsequently put on a watch list. The petty hood turning to radical Islam during a stint in jail is now a grimly predictable turn of events, particularly in France. In addition, the fact that France is suffering from another case of homegrown terrorism with a North African tinge is unsurprising. Homegrown terrorism is not the principle threat to other European nations–plots in Germany, for example, are often perpetrated by foreign nationals. However, terrorists who target France tend to be born and raised in the nation, often with their parents coming from former French colonies. The timing of Chekatt’s attack was all-too familiar. ISIS supporters regularly make threats towards the West in the Christmas holiday period. Last year, the State Department issued a travel warning for Americans visiting Europe, with the targeting of Christmas markets specifically mentioned. And with good reason: In December 2016, ISIS guided a Tunisian terrorist, Anas Amri, to take a truck and attack a Christmas market in Berlin. Amri killed 12 and injured 48. Islamist terrorists contemplated hitting Christmas markets even before the Sept. 11, 2001, terrorist attacks against the United States. One such plot was thwarted in 2000–ironically in Strasbourg. The challenge facing Europe, the U.S., and other parts of the world is to find a way to prevent more young people from embracing Islamist terrorism. No matter how many terrorists authorities arrest or kill, as long as new ones keep emerging it will be impossible to stop the deadly violence they spread. The post Attack at French Christmas Market Reminder of Looming Threat Islamist Terrorist Pose in Europe appeared first on The Daily Signal.